Well, that was the opening eight pages of Mermaid Fire Brigade. Not quite chapter one--more like the prologue. I'm setting the table. Three mermaid friends, thinking about finding jobs. I think it was a fun opener. I told you yesterday I was thinking of breaking it up into pieces, well that was Part 1. I have to level with you all, I'm swamped. You probably guessed it from my missing week earlier this month. This summer is very, VERY tight, time-wise. I have three books due out in 2012. One I finished last month. The next one is due July 5th and the third is due in September. These are fun books that I'm very excited about. But I'm going to be working very hard to meet those deadlines. So you can imagine how hard it can be to finish all that stuff, then start on a fresh page of a blog comic around midnight. Like I said, I'm swamped. I'm not sure what the solution is yet. My priority is the contracted books (of course.) 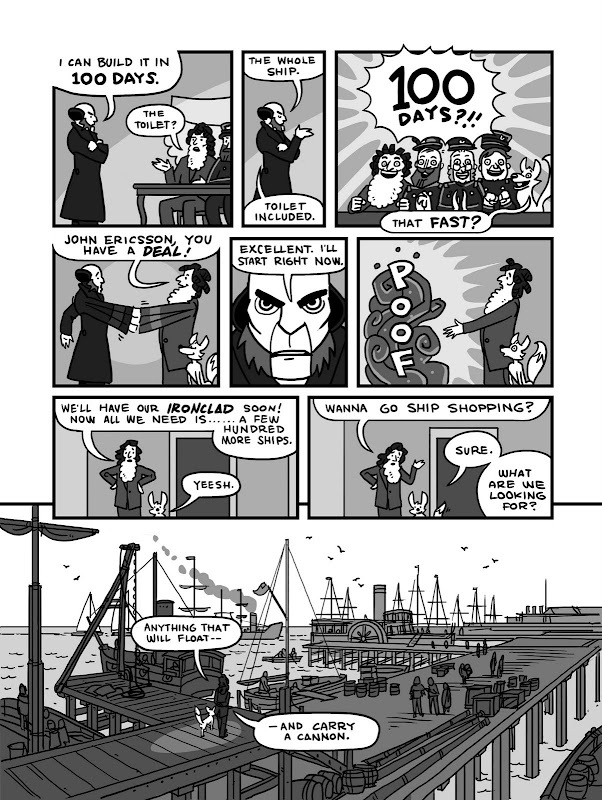 At the same time, these books were born on the blog (the one above sold because of my Lewis and Clark comic.) So I don't want to neglect the blog. I think I need to post simpler stories. Mermaid Fire Brigade was WAAAAAAAAAY too complex for my current work schedule. It was almost like doing a THIRD page after finishing the two for the book. It'll be back, but not until this current graphic novel project is finished. Bear with me. I'm figuring things out as I go. I don't know if a Monday-Wednesday-Friday schedule would work (just for the summer!) or even a Tuesday-Thursday...or maybe just a simpler drawing style (PINNIPED PARTY style!) I don't know. But I will continue to post stories and fun stuff--even if the schedule is a little different for the next three months. Who wants to check their computer every day in the summertime, anyway? It could be like a nice vacation for all of us. Sorry again for the rocky patch. First the missing week, then Mermaid Fire Brigade cutting off eight pages in. I'm not sure what my summer hours will be. But I'll keep you posted. Now I've got to get some sleep--I've got more pages to finish tomorrow. 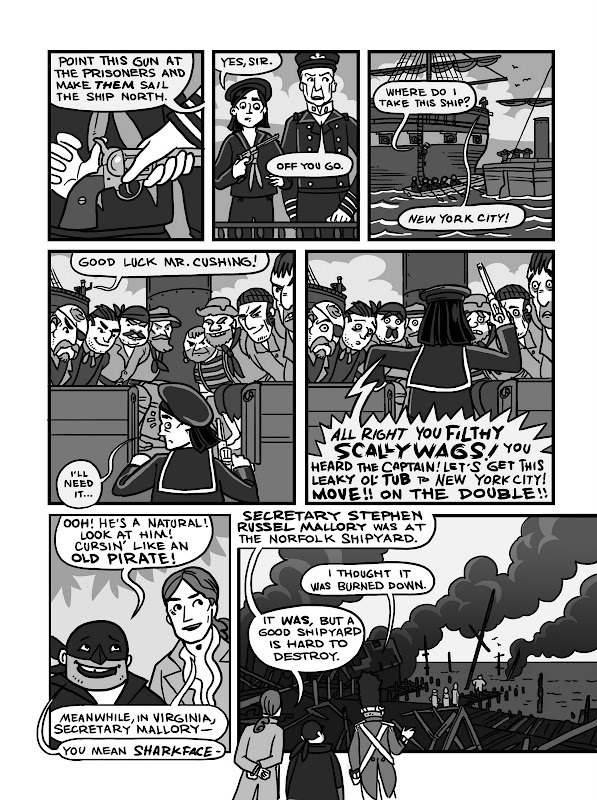 Enjoy the Civil War Navy sneak preview. I'll start something totally new tomorrow. Are you asking us to have patience?? Horror! Wow, I was just entertained by HISTORY! Way to go, Nate! Pinniped Party III. That's all I'll say. 2 finished pages a day? On top of cover, chapter headers and chidlren book illustrations?! Wow...good luck. I'm excited to read this! I love nonfiction graphic novels. Good luck with all of your deadlines! Thanks for the kind words everyone. I promise to keep thing rolling here on the site. History is WAY cooler when there are talking animals and people who disappear into smoke. It looks entertaining so far. I agree--who does want to check the computer every day in the summer? I usually check my fav blogs (like this) once or twice a week and just read what I missed. Work on your priorities and your fans will still be here.